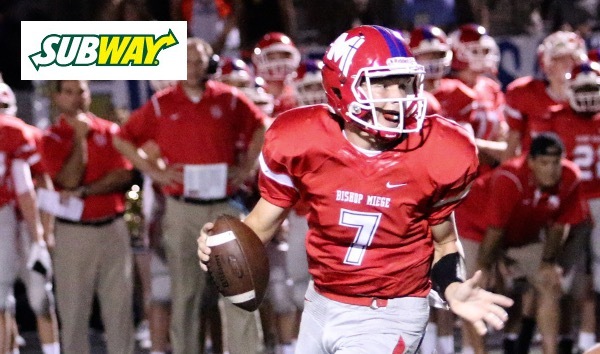 Subway sponsors our Friday Fresh Take where we provide a recap of some of the state's most notable games and performances from Friday night's action.Here’s a look at several of the results that caught our attention from Week 6. Andale didn’t lead until the final minute, but the No. 2 ranked Indians late rally was enough to top 4A-II No. 4 Wichita Collegiate, 32-21. The game was somewhat similar to last year’s contest with the two schools flipping roles. Last season, Andale was in control for much of the game only to see a late Collegiate rally force overtime where the Spartans would win 46-45. On Friday, Collegiate was in control for much of the game. The Spartans led 14-0 for much of the first half until Taylor Richter pulled the Indians within 14-6 at the break. Richter’s touchdown pass to Nathan Postlethwait pulled the Indians within 14-12 in the third quarter. But Collegiate would take control again on a Cody McNerney touchdown run for a 21-12 lead with 5:30 remaining. Richter hit Dylan Horsch on a touchdown pass to pull within 21-19, and the Indians got the ball back with 2:30 remaining. Richter scored from 17 yards out with a minute left to give the Indians a 25-21 lead. Collegiate tried a throw-back pass, but McNerney was intercepted by Jace Stuever who had an easy dart to the end zone. The Bishop Miege Stags scored within the first minute, scored on its first seven possessions, and built a 57-point lead by the mid-third quarter during a 64-21 win over the Mill Valley Jaguars. Stags wide receiver Landry Weber hauled in four touchdown passes in the victory. Quarterback Carter Putz threw five touchdown passes on the night. It was a statement win for the defending Class 4A Division I state champion over the defending Class 5A state champion. The top-ranked Stags are now on a five-game winning streak after falling 35-28 to Blue Valley in the season opener. Mill Valley, which entered the week ranked No. 4 in Class 5A, lost its third game in a row. Manhattan quarterback Ian Trapp scored on a 9-yard touchdown run with just over two minutes remaining to propel the Indians to a 27-22 win over rival Junction City. Making an appearance on defense, Trapp then sealed the victory with a late interception of Junction City quarterback Ryan Henington allowing the Indians to reclaim the Silver Trophy awarded annually to the game’s winner. This marked the eighth consecutive game in the series decided by eight points or fewer. Junction City won last year’s game 17-14 in overtime. Manhattan built a 21-10 halftime lead behind touchdown runs by Trapp and Tariq Gerald in the second quarter. But Junction City would pull within 21-16 on a Henington touchdown run after halftime. The Blue Jays then took the lead 22-21 on a Tim Bell touchdown run with 5:30 remaining in the game before Trapp’s late heroics. Trapp rushed for 175 yards on the night only out done by Henington who led Junction City with 265 rushing yards. The Wichita Northwest Grizzlies scored touchdowns on four of their first five possessions and appeared to be on their way to blowing out the previously unbeaten Garden City Buffaloes. Northwest led 27-0 mid-way through the second quarter, but the Buffs scored a pair of touchdowns before halftime to pull within 27-14, then shutout the Grizzly offense in the second half to finish a wild comeback and a 46-34 victory. Jesse Nunez threw touchdown passes to Peyton Hill and Jason Yi before halftime to pull the Buffs within 27-14. In the second half, Hill and Nunez took over behind the Garden City offensive line. Nunez scored two touchdowns in the third quarter to pull Garden City even at 27, then gave the Buffs a 33-27 lead early in the fourth quarter on his third touchdown run. Northwest would respond with a huge special teams play as Jalin Terrell returned a blocked punt for a touchdown to put the Grizzlies up 34-33 with just over four minutes remaining. Garden City, though, got a huge return to midfield on the ensuing kickoff by Quinton LaPointe, and a late hit out-of-bounds tacked on 15-more yards. Nunez scored shortly after to put Garden City up 39-34. Northwest got the ball back with over a minute remaining, but quarterback Austin Anderson’s pass was picked by LaPointe and returned for a touchdown to seal the win. Hill led Garden City with 221 yards rushing, while Nunez contributed 160 on the ground with his four touchdowns. Three Jahlyl Rounds touchdown runs helped Northwest to their big early lead. Rounds finished with 171 rushing yards and three scores. Eleven teams in 8-Man, Division-I entered Week 6 action undefeated. But the Week 6 schedule paired eight of those teams together in four high-profile unbeaten matchups. In the Kpreps Fan’s Choice for Game of the Week, St. Francis rolled to a 52-6 victory over rival Atwood-Rawlins County to retain the Yoke in the annual Yoke Bowl. The Indians jumped out to a 14-0 lead after one quarter, and expanded that lead to 36-0 by halftime. St. Francis is now in the driver’s seat in District 8 with a 4-0 record and remaining games against Quinter (0-6) and WaKeeney-Trego (3-3). Burlingame rushed for more than 300 yards and scored the game’s final 38 points in handing Clifton-Clyde its first loss of the season. The Bearcats led 34-20 in the second quarter and stuffed Clifton-Clyde on a fourth-and-goal play. Shortly after, Burlingame’s Seth Greenwood broke free the length of the field for a touchdown run that put the Bearcats up 42-20. Clifton-Clyde couldn’t overcome six turnovers in the game. St. Paul shut out West Elk in the second and fourth quarters to earn a 66-42 victory in a matchup of two undefeated teams. The Indians and Patriots were tied at 6-6 after one quarter, but St. Paul scored three times to take a 28-6 halftime lead. West Elk came to life in the third quarter, outscoring the Indians 36-24 to pull within 52-42 heading to the fourth. St. Paul would hold the Patriots scoreless and tack on two more touchdowns to win 66-42. Osborne defeated Logan-Palco 84-44 in the fourth unbeaten showdown. Read the full review of the Bulldogs win at Kpreps.com. The Spearville Royal Lancers rolled to their 19th consecutive win with a 52-6 victory over Ness City in District 7 play. Luke Heskamp scored twice during the Lancers’ 22-point first quarter with Kolby Stein adding the other score on a 55-yard run. Stein added a pair of touchdowns in the second quarter on a pass to Kyler Stein and a fumble return for a touchdown. Spearville led 52-0 just before halftime when Ness City scored on a long touchdown pass. Spring Hill stopped a late Louisburg two-point attempt to upset the No. 3 ranked Wildcats, 28-27. The Broncos and Wildcats were tied at halftime 14-14, and remain knotted after three quarters at 21-21. Mid-way through the fourth quarter, Louisburg drove inside the Spring Hill 20-yard line, but fumbled. The Broncos would respond with a short touchdown run with just over three minutes remaining to take a 28-21 lead. Louisburg scored with ten seconds remaining on a 7-yard touchdown pass from Grant Harding to Korbin Hankinson. Louisburg decided to go for the two-point conversion and the win, but the conversion failed. Topeka Hayden’s Patrick Ellrich connected on a 46-yard field goal as time expired to lift the Wildcats to a 23-20 victory over Shawnee Heights. Trailing 17-7 entering the fourth quarter, Hayden scored a pair of touchdowns to take a 20-17 lead. Sampson Huston tossed a touchdown pass to Deshawn Hanika and Andrew Smith added a touchdown run for the Wildcats. Shawnee Heights responded with a Tyler Zentner 42-yard field goal to tie the game at 20. Hayden got the ball back with 1:30 remaining and drove to the Heights’ 30-yard line with a second remaining to set up Ellrich’s winning kick. Goddard-Eisenhower led undefeated Valley Center 28-14 at halftime, but the Hornet rallied to tie the game at 28 heading to the fourth quarter. Valley Center then scored 26, fourth-quarter points to pull away for the 54-28 victory. Wyatt Lang tossed touchdown passes to Keyon Saunders and Tyler Brown and ran for a touchdown in the fourth quarter barrage. Don Boone also rushed for a touchdown in the final quarter. Lange rushed for 185 yards and three touchdowns and passed for 220 yards and three more scores. Two 8-man teams lit up the scoreboard into the 90s in order secure important district victories on Friday night. Hartford outscored Hutchinson Central Christian 94-60 to gain the first key win among three strong playoff contenders’ challenging for two spots in District II. Caldwell, Hartford, and Central Christian have separated themselves as favorites in the district to this point, and the Jaguars took a big step towards a playoff spot Friday night in Hutchinson. Clayton Fowler scored nine total touchdowns for the Jaguars in the win, including seven rushing and two receiving. Quarterback Danen Kistner threw three touchdown passes and returned an onside kick for a touchdown. Hartford led 62-30 at halftime, and 76-44 after three quarters. Caldwell plays Hartford next week and Central Christian in Week 9. Rolla outscored Fowler 90-46 as the Pirates secured their second win of the season. The Pirates built a 40-18 halftime lead behind four touchdown runs by Carson Milburn. With the win, Rolla and Ingalls sit atop the 8M-II, District 8 standings at 2-0 each. Ingalls won a wild shootout over Minneola, 62-58 on Friday night.